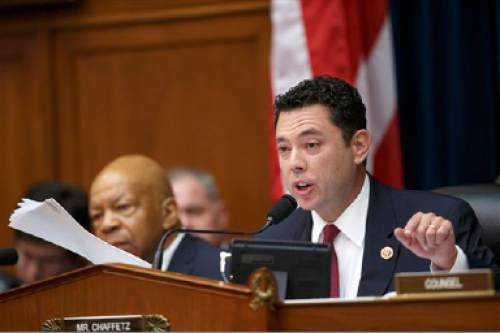 AP File Photo Rep. Jason Chaffetz, R-Utah, warns that terrorists can exploit the refugee relocation program. 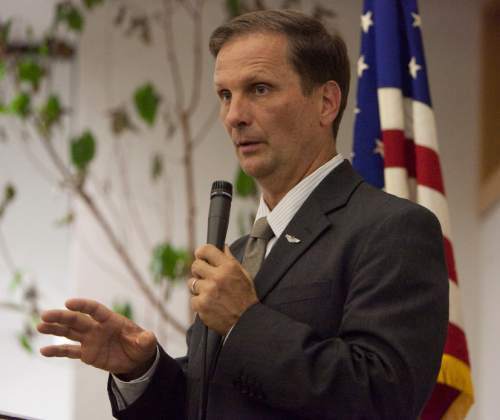 Steve Griffin | Tribune file photo Rep. Chris Stewart, R-Utah, shown here in 2013, says the United States needs to halt plans for relocating refugees and overhaul its screening process-- a fix that could take years. 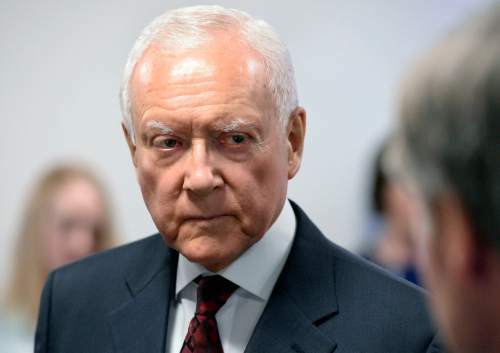 Al Hartmann | Tribune file photo Sen. Orrin Hatch, R-Utah, says it would be "irresponsible" to simplify the Syrian refugee issues as one of "mere compassion." Utah&apos;s members of Congress want to stop Syrian refugees from entering the country until new security checks are implemented, a process that could take years. Rep. Chris Stewart, R-Utah, a member of the Intelligence Committee, wants a moratorium in place until the United States could check a Syrian national&apos;s work history, criminal record and talk to family and friends. He said that is "impossible" to do that now or any time soon, given the civil war and the territory held by the Islamic State militant group in that country. "Ultimately the way to fix it is to fix the war, end the war and make the area not so chaotic," Stewart said of the conflict now in its fifth year. Sens. Orrin Hatch and Mike Lee and Reps. Rob Bishop, Jason Chaffetz and Mia Love, all Utah Republicans, were among those saying security concerns outweigh the immediate humanitarian need. It appears at least one of the terrorists who attacked Paris last Friday used a Syrian passport and entered the nation through well-traveled migration routes. "We must know who is coming into our country. It&apos;s irresponsible, particularly after Friday&apos;s attacks, to reduce this issue to one of mere compassion," said Hatch. "We cannot allow terrorists to take advantage of our benevolence." Lee noted that "Utah has a proud tradition of being a national leader when it comes to taking in refugees from around the world. But there are just too many open security questions at this time when it comes to Syrian refugees." House Republicans are working rapidly on legislation that would block the administration from admitting refugees from Syria and votes could take place as early as this week. President Barack Obama has previously promised to accept at least 10,000 Syrian refugees in the next year and the White House intends to stick to that plan. "The refugees that have captivated so much attention in the wake of Friday&apos;s attack are fleeing precisely the type of senseless slaughter that occurred in Paris," said Amy Pope, deputy homeland security adviser to the president. "To slam the door in their faces  to decide not to help when we know that we can help  would be a betrayal of our values. It would be un-American." There&apos;s been a clear partisan divide in the refugee debate. By Tuesday, 30 governors said they want to block any new Syrian refugees from entering their states due to security concerns, all but one of them Republican. Only two GOP governors  Utah Gov. Gary Herbert and South Dakota Gov. Dennis Daugaard  have remained open to Syrian refugees. Twelve Democratic governors have said they would welcome Syrians, according to FiveThirtyEight, a politics and culture blog owned by ESPN. Herbert, the chairman of the National Governors Association, has asked for a review of the security situation and wants to consult with the state&apos;s congressional delegation. "The governor will diligently assess these security protocols, and if warranted, implement a change in state policy," said Jon Cox, Herbert&apos;s spokesman. "Utahns are well known for our compassion for those who are fleeing the violence in their homelands, and we will work to do all we can to ease their suffering without compromising public safety." Utah has resettled 12 Syrian refugees, comprising two families. The state expects as many as a few hundred between March and next October. By law, governors can&apos;t block refugees from settling in their state, though they could make an attempt to deny some help offered to those resettled from troubled parts of the globe. Refugee resettlement is a federal responsibility and once allowed into the country, no one is blocked from crossing state lines. "It would be an impossible task and probably not a good idea, which is why they don&apos;t have the authority to do it," Stewart said of a governor&apos;s authority in such matters. The lawmaker ­ who represents the 2nd Congressional District, including Salt Lake City  has attended a series of confidential Intelligence Committee briefings with top officials from the FBI and other federal agencies following the Paris attacks. French authorities found a Syrian passport next to one of the eight terrorists who killed 129 people and injured 350 others in Paris on Friday. The passport was scanned in Greece and other countries, along the path that hundreds of thousands of migrants have taken from Syria to Europe. The Islamic State militant group claimed credit for the attacks. Stewart said it&apos;s not only the stated goal of the Islamic State to use the refugee system to infiltrate the United States, but that it&apos;s possible. "I can promise you that [the federal government] can not adequately vet these guys," Stewart said of potential Syrian refugees. He contrasted the situation in Syria with the one in Iraq, where even during the long war, a government has been in place. The United States and Utah have welcomed refugees from Iraq and Stewart said those checks there have been more successful. Chaffetz has argued for years that the government should slow the refugee process and implement a tracking program, identifying when refugees enter and leave the country. Before the Paris attacks, he warned that terrorists could exploit the refugee program. But Pope, from the White House, said: "We can do it safely." She argued the screening process is the toughest of any traveler to the United States and that Syrian nationals undergo additional screening. Stewart&apos;s staff is working on an amendment to the House legislation that would allow certain types of Syrian refugees to enter the United States. He mentioned orphaned children as an example. "We know there are thousands and thousands of children left with no family at all," he said. "It would make a statement that we are a compassionate people, that we do want to help."